Step 1. Right Click and click on NewString value as "PreferredDc"
And those steps worked for me. I ran echo %logonserver% to determine the Domain Controller my server was connected to and added a registry key to tell CRM that was my Preferred Domain Controller. Immediately (no reboot required) Deployment Manager was working again and I was able to delete my SDK Message Processing Steps. So it seems like the CRM Deployment Service caches a Domain Controller and the one cached was no longer working correctly. I was able to ping it, so it was up, but it wasn’t able to perform the function requested of it. We removed the registry key when finished. I don’t think we want to tie the CRM deployment service to a particular DC. I am hoping to learn more about this from Microsoft to determine steps to avoid these steps in the future. Caching a Domain Controller in an Enterprise setting where Domain Controllers come and go seems like a product deficiency. Neither an IISReset or a server reboot helped us. This entry was posted in Uncategorized and tagged CRM 2011 on April 24, 2013 by Gareth Tucker. Global Search is provided as an executable that you install. Once quirk of the installation process is the license activation screen launches in the context of your default Organisation and you cannot select an alternative Organisation. Checking the instructions, you need to manually navigate to a different URL to activate the product for a different Organisation. This is a bit lame, most other ISV vendors do a better of job of this. Akvelon’s installation instructions are of a high standard though. 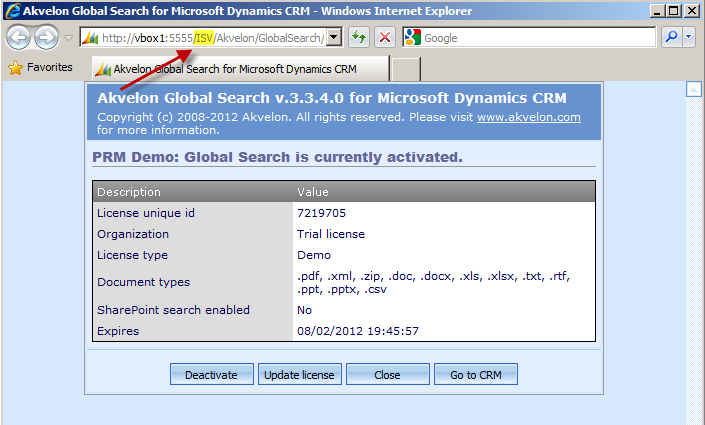 Oh and uglier still, I notice the URL refers to the ISV folder on the CRM Server – eek! That is not supposed to be used anymore with CRM 2011, these guys haven’t updated their installer or architecture for CRM 2011 to the current standard. The product will work, but this architectural decision leaves me with some doubt about this vendor. Hopefully, plans exist to update this. There is a second installer you need to run if you wish to allow searching of Attachments, it installs some supporting technologies for you. Looks like Attachment search is enabled through a crawler executable that indexes the contents of attachment files every 15 minutes. The Administrator role grants access to global settings, the Experienced Users role grants users access to personal search settings and the the 3rd role grants access to just the Search tool. By this point you should get the picture, these guys have built out a fairly extensive search solution. 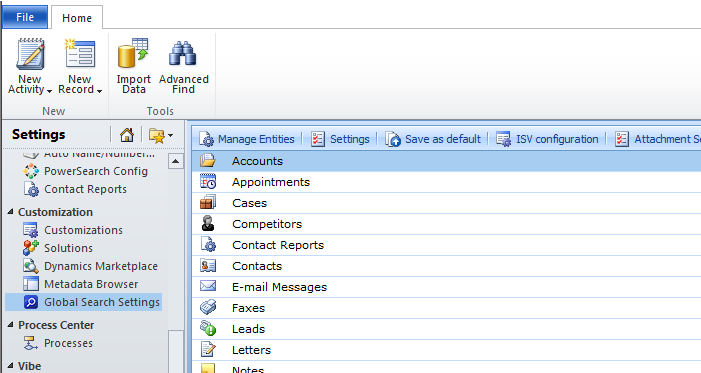 I wonder, do CRM users really need this much functionality? I haven’t come across this before, Microsoft CRM mostly contains structured data. However, once you start talking using CRM heavily for tracking emails and attachments decent search does become more important. 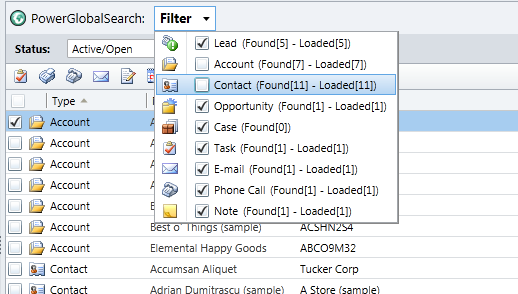 Out of the box, Microsoft CRM has always suffered from poor email search, it has limited CRM’s ability to act as a centralised email repository. The unspoken reality is even if you are tracking emails religiously into CRM you really need to store your emails locally as well for this reason. Interesting. You can use a wildcard to search for e.g. “Hap&y”. You can type in 2 words such as “Happy Gilmour” and any record that contains both “Happy” and “Gilmour” in its search fields will be returned, even if those words are in separate fields. 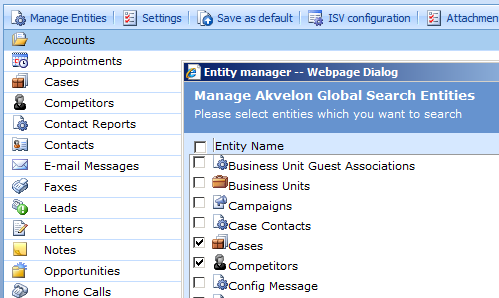 End users access PowerGlobalSearch from the CRM menu, with the application appearing in the main application pane just like a CRM view. 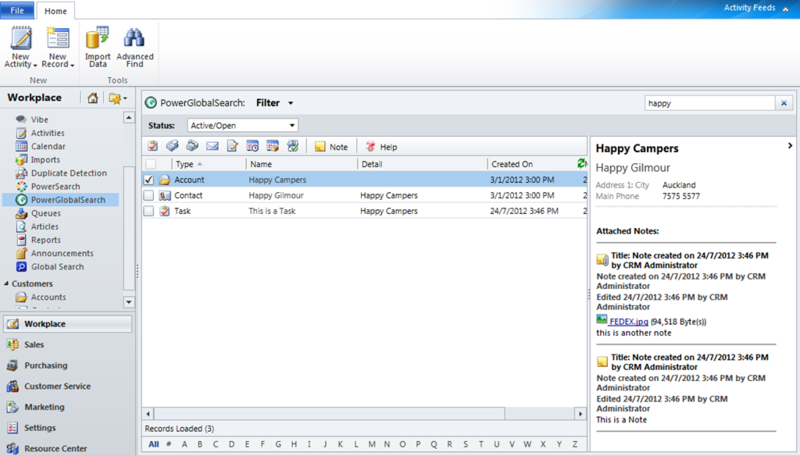 The look and feel is very Microsoft CRM 2011, they’ve done a great job with that. Search results are listed without any grouping, you get one big list, one set of shared columns. 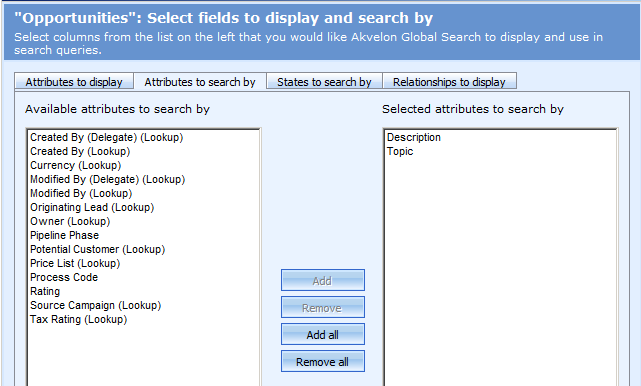 No other filtering is available, Akvelon offers more functionality here. It is interesting that Power Objects have adopted this consolidated view approach where all records from the different entities are all displayed in the same column set. It makes for a much cleaner UI but it means only a finite number of fields can be displayed in the search results. Akvelon is more configurable here, but I do prefer Power Object’s cleaner lines. Silverlight app, won’t run on 64-bit browsers or 64-bit version of Outlook Client (this is an issue for any Silverlight based ISV add-on) – and what is the future of Silverlight? What’s up with Power Objects comic book style website?!? 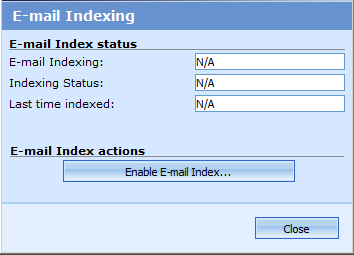 You select which fields should be searched against, which columns should be displayed in the search results and which status fields should be considered as ‘Active’. There is some sort of Favourites screen but the UI didn’t render large enough for me to be able to save any changes. The presentation standard of this screen is not great. In general, I wasn’t enjoying myself here, the experience was a definite step down after the first 2 products, but configuration is a one time thing so perhaps it doesn’t matter a whole lot. Well you have 2 good products to pick here from Akvelon and Power Objects. I think the critical decision factors will be price and functionality. 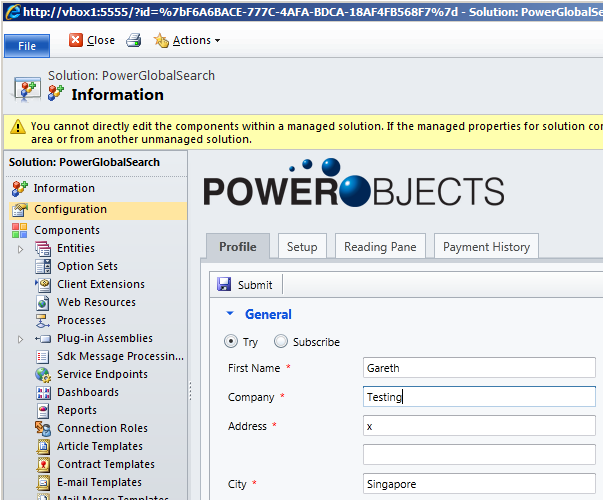 I prefer the user experience with Power Objects clearly Akvelon packs in a lot more functionality – but do you need it? I priced both products recently for a 500 user deal and Akvelon’s purchase price was significantly higher then Power Objects’. However, when I took into account annual costs over 3-5 years the gap closed significantly. You will need to do your own price comparison for your user size to see which prices out better. Both products can easily be installed under a trial license. Please use the Comments below to share your experiences and opinions. 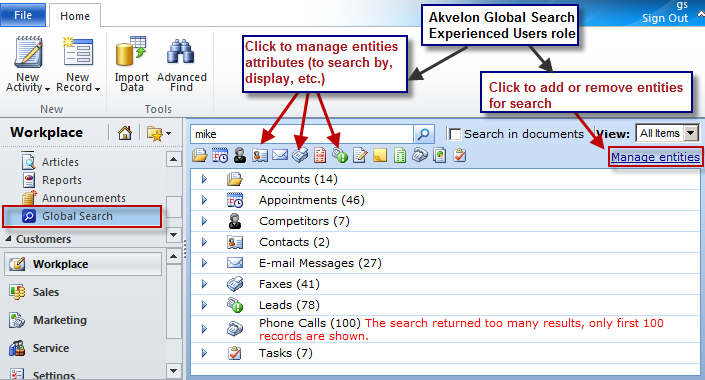 This entry was posted in Uncategorized and tagged Akvelon, CRM 2011, eView, Global Search, MSCRMAddons.com, MyCRM, Power Objects, PowerGlobalSearch, PowerSearch on July 24, 2012 by Gareth Tucker. On the Contract Template you indicate whether the Contract provides for a fixed number of Cases, a fixed number of Hours or covers a number of days. And I guess that provides fairly good cover. If I think of support contracts my employer offers they tend to fall into one of those 3 categories. Contract Templates cannot be edited once created, if a change is required you need to create new Contract Templates. You don’t seem to be able to delete or deactivate unwanted Contract Templates once they have been used at least once. When you go to create a Service Contracts CRM acts slightly differently from normal, it pops a dialog and asks you to select a Contract Template, you chose one and only then does the Service Contract form appear. So, the Contract Template is not just a data entry shortcut, it drives the behaviour of Service Contracts. There’s a bunch of other fields on the Contract Line, you can specify a Product and enter pricing details. And of course you can create multiple Contract lines under a Contract if you want. 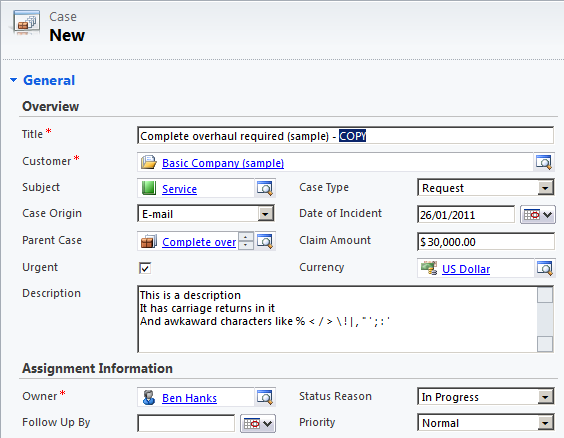 To activate the Contract so that Cases can be charged to it you need to click the “Invoice Contract” button. It doesn’t create an Invoice record, it just changes the status of the Contract to Invoiced. Invoiced Contracts can be put on hold via the “Hold Contract” button, this temporarily prevents Cases from being charged to the Contract (I guess you might use this if payment lapsed). I think that about covers it for Service Contracts. If your requirements don’t fit within these parameters then I recommend a cautious review of the suitability of this out of the box design. You may find adopting some custom entities and/or building out your own business logic extensions might be a better approach. Like all CRM scenarios you need to measure the gap and look at the unique characteristics of the CRM entities and screens and decide whether those characteristics are of benefit or are in the way. UPDATE: Just noticed that cancelled Contracts can be Renewed via a “Renew Contract” button. This will create a duplicate Contract with a Status of Draft. Draft – after a contract is created, it is automatically assigned a Draft status. This indicates the contract is still under development. Draft contracts can be edited but they cannot be linked to a case. Invoiced – changing the contract status from Draft to Invoiced indicates your organization and the customer have agreed to the contract terms. A contract must have at least one contract line to be invoiced. A contract with a status value of Invoiced cannot be edited or deleted, it can only be cancelled or put on Hold. status value of Active cannot be edited or deleted, but new Contract Lines can be added (to allow extensions to the Contract). On Hold – an active contract can be placed on hold. A contract in an On Hold state cannot be edited, cancelled, or deleted, and it cannot be associated with cases. It can be reactivated by releasing the hold. Cancelled – an active contract can also be cancelled. When a contract has a status of Cancelled, it cannot be associated with cases. A cancelled contract can be renewed. Expired – a contract remains active until it reaches its end date, at which time its status is changed to Expired. Expired contracts can be renewed. 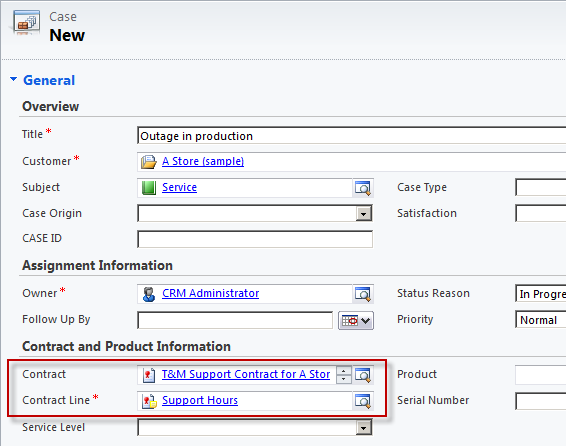 Setup steps for the Service Scheduling module need to be completed under Settings: Business Management. 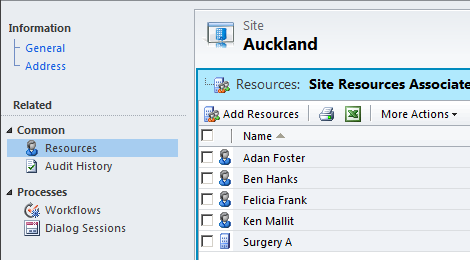 Next define the geographic locations where your Resources can be utilised. You create these as Sites. Under each Site you select the Resources that are valid for that Site. Later when scheduling you will take a customer request for a Service and the scheduling engine can optionally apply a Site constraint to ensure only Resources listed for the Site are scheduled. 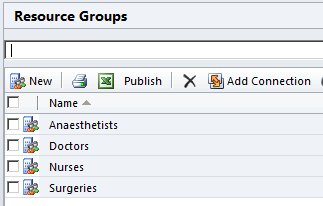 I’ve specified Resource Groups here but you can specify specific Resources instead if required – e.g. 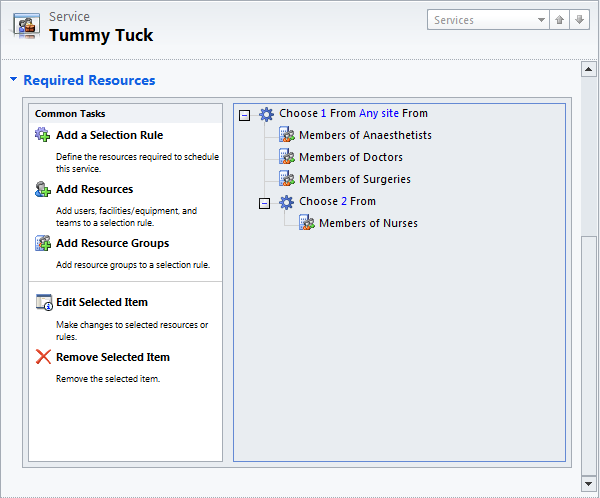 for the Tummy Tuck maybe you have to use Surgery A, or the Doctor has to be Ben Hanks. You will see that Sites are mentioned as well, this is where you can limit the pool of resources by their Site associations (to prevent you scheduling resources from distant locations). Ok, that’s everything setup. 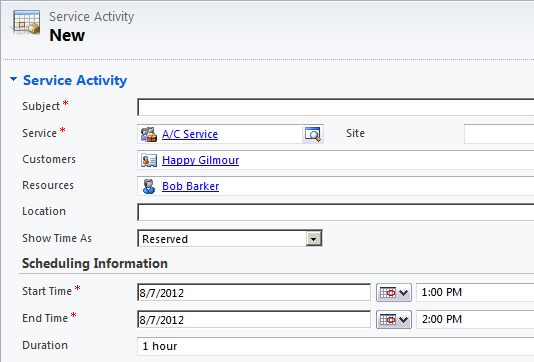 CRM can now start assisting us with the scheduling of Services. We will give CRM requests like “Mr Smith wants a Tummy Tuck in Auckland one morning next week” and CRM will use all of the setup configuration we have fed it to determine which applicable resources are available. HOWEVER, CRM does not go as far as auto-scheduling. 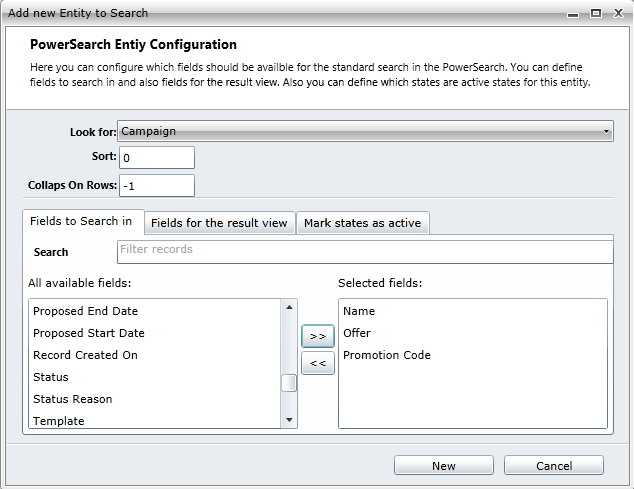 You still need to pick from CRM’s search results the resource you want. 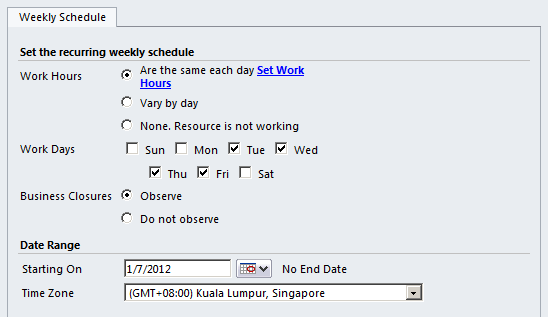 The “Type” dropdown above the calendar view allows you to choose the record type to display down the calendar. 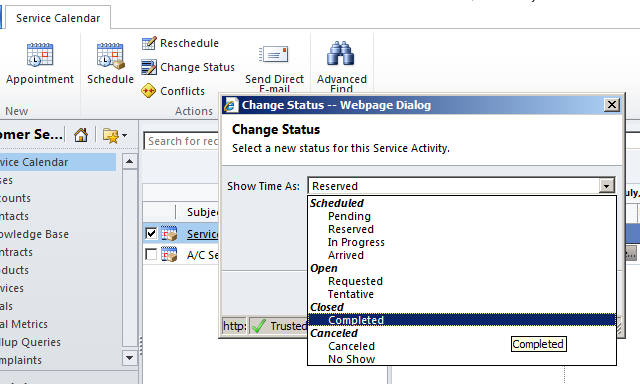 To schedule a Service you can click the Schedule button on the Ribbon and CRM will pop first a Service Activity form and then pop over top of that the Schedule Service Activity screen. 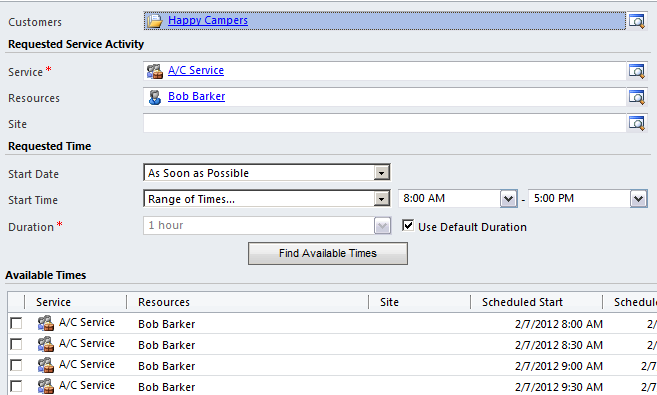 The Schedule Service Activity Screen is essentially an availability search screen that helps you assign Resources to the Service Activity record. You will notice that I’ve changed scenarios with my screenshot. 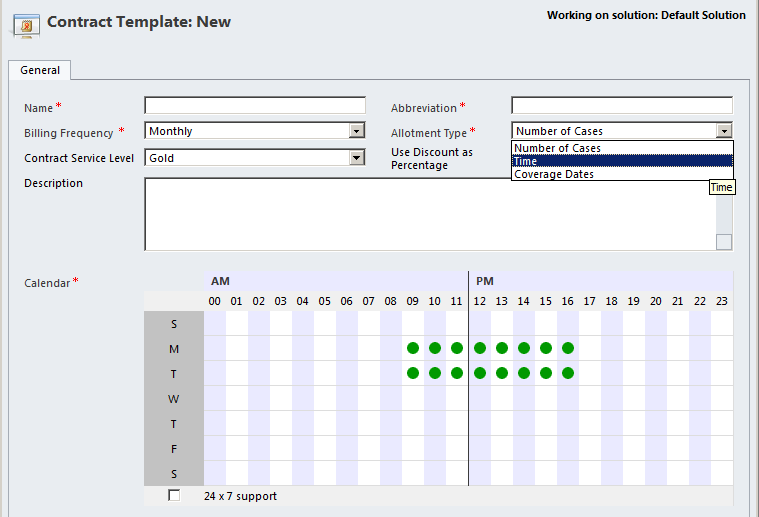 I got to this point with my Surgery example and hit the limitations of the Service Scheduling module (which I admit I had forgotten). What I found was the grid at the bottom listed out all of available timeslots for all of the resources that met the requirements of my Service, however CRM doesn’t bundle these for you – it doesn’t say “hey next Thursday at 2pm you could go with Bob, Adan, Jill, Nina and Surgery A”. It doesn’t even allow any useful sorting abilities to allow you to do this yourself. And worse still, you cannot actually select more than one Resource on this screen. 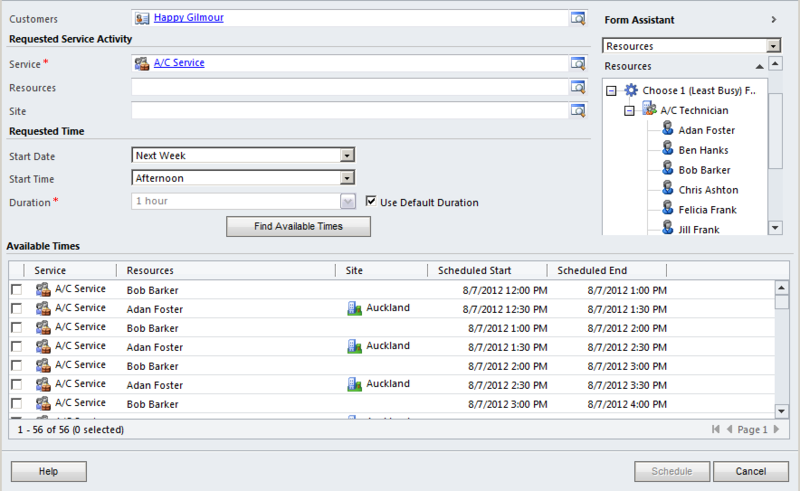 The CRM scheduling screen just doesn’t support multiple-resource bookings. So I changed my scenario to something a lot simpler. I think that about covers it for Service Scheduling. In summary, it doesn’t handle multi-resource bookings well. 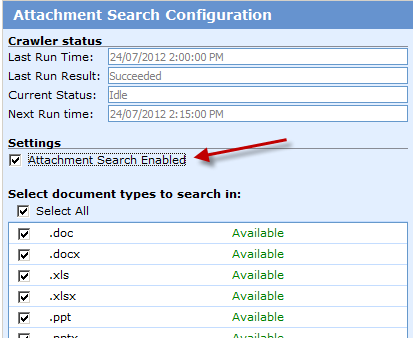 It does an ok job with simple single-resource scheduling offering some good search abilities. A couple things I haven’t mentioned is the Service Calendar needs to be manually refreshed when you change an existing calendar item, that’s not ideal. 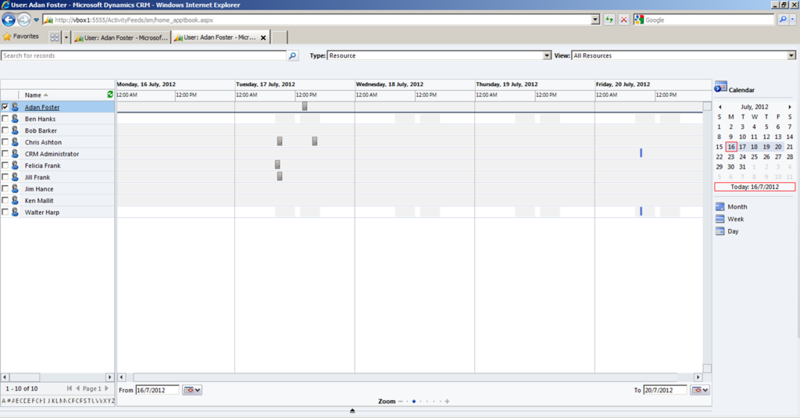 A big concern to me as an implementer is neither the Service Calendar or the Schedule Service Activity screen can be customised. This leaves me very uncomfortable, I normally have customisation options I can discuss with a customer – here the only answers are “Sorry, I can’t change anything” or “Sorry, we would have to build a custom version of this screen to give you that”. It is a validation engine for service scheduling. 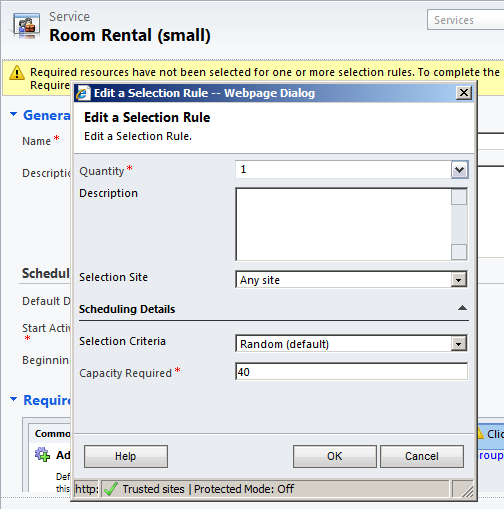 You setup the rules and then schedule manually or via your own custom user interface and it will let you know when you break the availability rules. 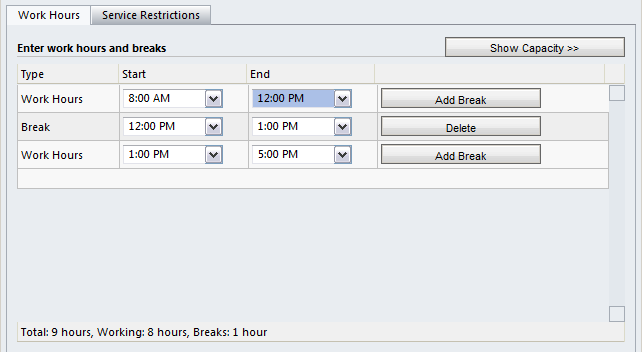 Then when requesting available resources/times these requirements and constraints will be taken into account. 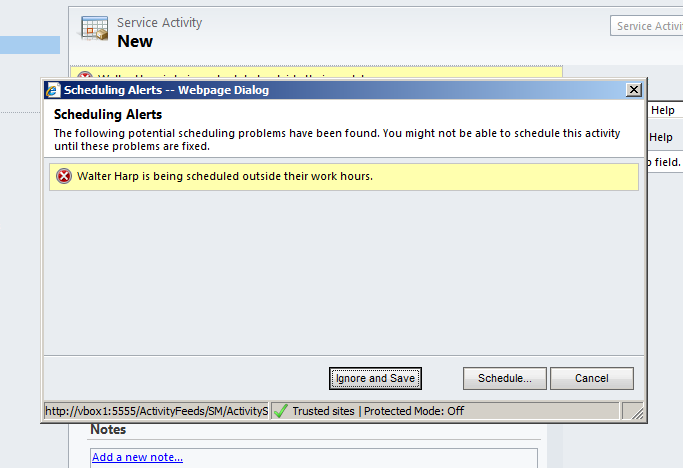 I’m keen to hear where you have found CRM’s Service Scheduling module of use. Please use the Comments feature below. 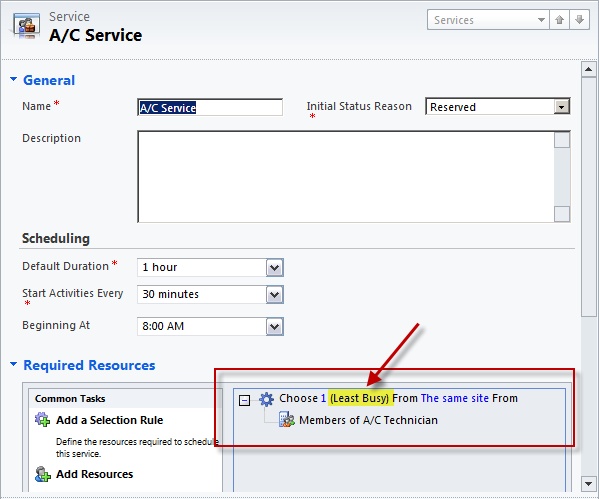 This entry was posted in Uncategorized and tagged CRM 2011, Service Contracts, Service Scheduling on July 13, 2012 by Gareth Tucker. A default Currency can be specified under each user’s Personal Options and on each Customer record. The Organisation too has a default currency set. Default Price Lists can be specified on Customer records. 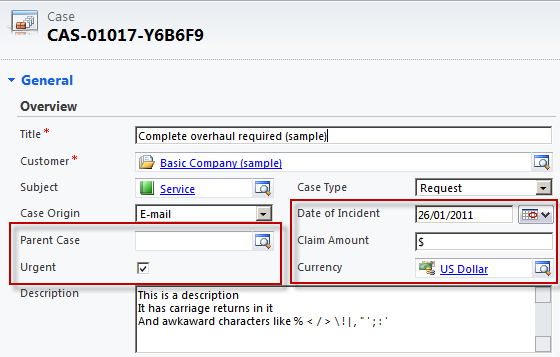 When creating a new Opportunity from the context of a Customer record the Currency and Price List specified on the Customer record will default down on to the Opportunity record. 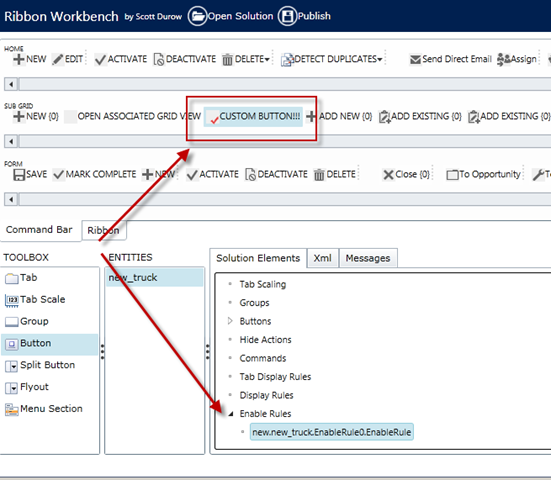 When creating a new Opportunity outside of the context of a Customer record the Currency field defaults based on the value set in your Personal Options. The Price List field does not default at all. If you don’t have a Currency set under your Personal Options then the Organisation default currency applies. Whenever selecting a Price List on an Opportunity, Quote or Order the list of selections will be filtered by the Currency specified. i.e. each Price List is tied to a Currency. When defining a Products a Unit Group must be specified. The Unit Group is a collection of ‘units of measure’ that the Product can be priced in – e.g. you might have a Unit Group called “Cans” and within that Group you might have the following Units: Each, 6-Pack, Tray, Carton and Pallet. The most granular unit should be defined as the Primary Unit – in the Can example this would be the “Each” Unit. On the other Units you define the unit translation required to get from the Primary Unit to this Unit, e.g. on 6-Pack you enter a quantity of 6 and on Tray you enter a quantity of 24. Although I’m not sure this is used in anyway by CRM, CRM does not attempt to track inventory levels – that is really an ERP function. Product Prices are stored on Price Lists. Under a Price List you create an entry for a Product where you specify the Price for a particular Unit. e.g. I have a Price List Item on the “USD Retail” Price List for the “Coke Can” Product where I say $5 is the price of a “6-Pack”. Each Price List item can have a specific Price entered against it or a % can be entered and the pricing derived by combining that % with the List Price or Cost Amount specified on the Product record. This allows you to have standard costs and prices for the Product but varying Price Lists. Discount Lists can be defined and applied to Price List Item records to add a Quantity Break discount table to the pricing (e.g. get 5% when you buy 10-20 units, get 10% off when you buy 21-30 units). When creating a Opportunity, Quote or Order you need to specify a Price List before you can specify Products. Then when you go to select a Product the Products displayed to you will be filtered to only those that have Prices on that Price List. Having selected a Product you next need to select a Unit. The Units you can select from are filtered to only those that appear on the Price List for the Product selected. Lastly you enter a Quantity. 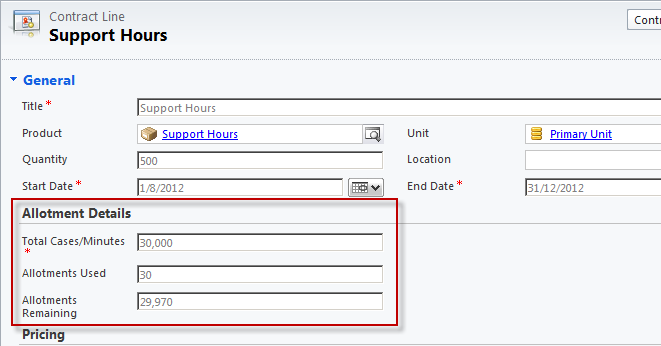 With those inputs specified CRM can now price your line item. A Quote can be created from an Opportunity – most of the Quote details are automatically populated. The Quote is automatically saved as it is created (you may see the screen flash as the form refreshes). All of the product, quantity, discount and freight details can be changed if required. When you are ready to present a Quote to a Customer you should click the Activate Quote button – this locks the Quote. It can now only be changed via a Revision process which will maintain version history. To change a Quote – e.g. 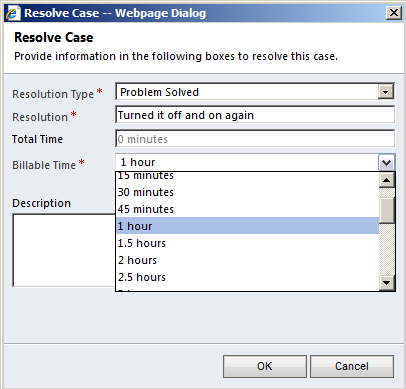 to give the Customer a revised Quote – click the Revise button. The Quote record will be duplicated and the original Quote flagged as Closed. The new Quote will share the same Quote ID but have a unique Revision ID (behind the scenes it is a new Quote record with its own unique GUID). There is a “Get Products” button on the Quote form that will allow you to copy the Products from the Quote’s parent Opportunity down to the Quote record (presumably catering for scenarios where the Opp has been updated after the Quote has been created). Fairly useless feature. 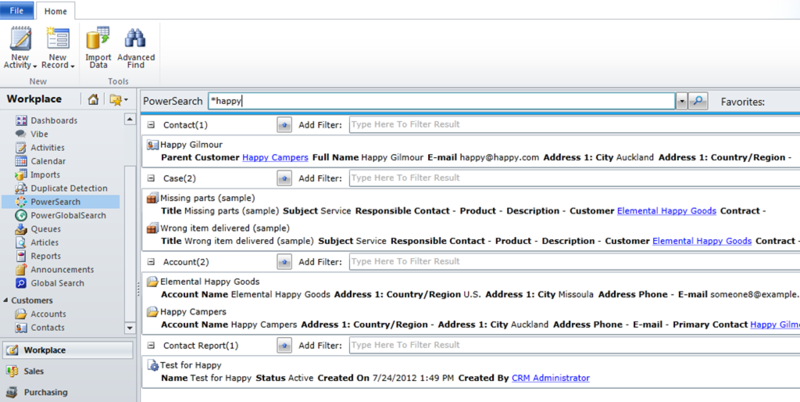 The “Print Quote” button launches CRM’s native Mail Merge feature. You pick a Mail Merge template and Word will launch. The user experience is dreadful. 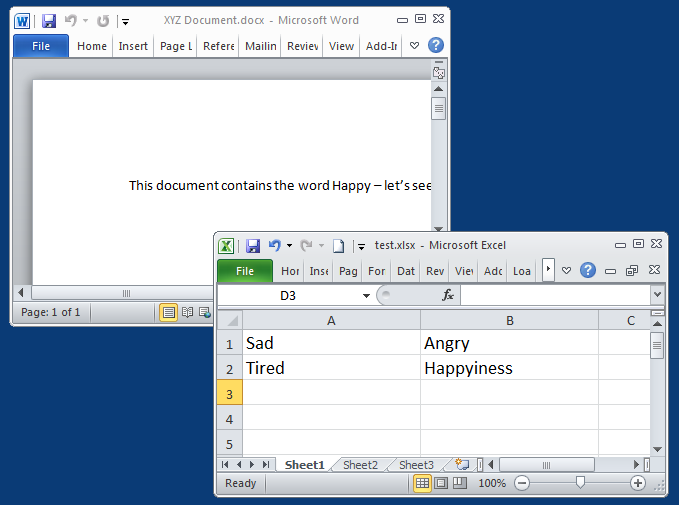 The sample template included with Microsoft is abysmal. You will need a better solution than this if you need to produce Quotes from CRM. The minimal coding solution is to use an SSRS report but this is still a poor user experience, I would reach into the SDK for something a little smarter or go with a 3rd party add-on (e.g. 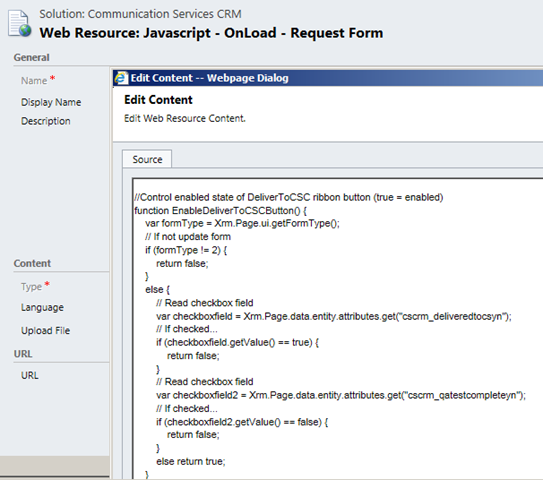 MyCRM’s ePDF product). The “Close Quote” button allows you to close an activated Quote record. During this process you can request a revision be created which would give you the same end result as if you had pressed the Revise button. If you don’t chose to have a revision created you are effectively just cancelling/deactivating the quote and you get the option of closing the Opportunity as Lost at the same time. This whole experience feels clunky and unnecessarily complex, the button should just set the Quote status to inactive/cancelled and offer nothing else. To progress an activated Quote and indicate it has been accepted you click the “Create Order” button. A sub-screen is popped and you are given the option to close the related Opportunity as Won at the same time. This screen will close the Quote as Won, create an Order record based on the Quote and optionally close the related Opportunity as Won. If you opt for the Opportunity closure to happen and the Opportunity has other open Quotes attached to it they will be automatically cancelled (the concept being that these were alternative proposals and the customer went with the Quote that you have just closed so these other Quotes are no longer of interest). Order records are parented by Quote and Opportunity records, these lookup fields are placed low on the Order form by default. You can create Orders from Open Opportunities but I get the feeling you are really expected to follow the “Opportunity —> Quote –> Order” process flow. The Order Pricing is locked initially. If the pricing changes on the Price List and you click the Recalculate button the Order pricing will not update. If however you click the “Use Current Pricing” button the Order will be unlocked and the unit prices will be refreshed from the current pricing on the Price List. Whilst unlocked the Recalculate button will refresh the pricing from the Price List. The “Get Products” and “Lookup Address” buttons are here and work the same way. To progress the Order you have 3 options: the “Create Invoice” button, the “Fulfill Order” button or the “Cancel Order” button. 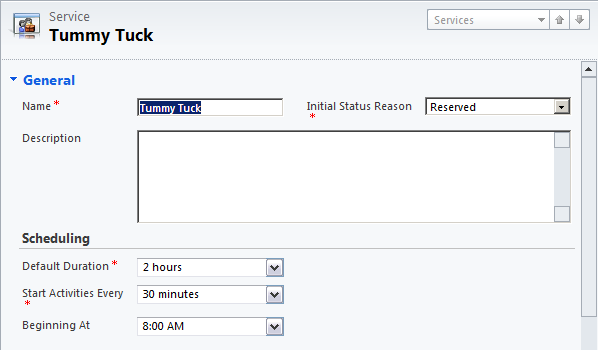 The “Fulfill Order” button essentially closes the Order and updates the status to “Fulfilled” – i.e. we have shipped the order to the customer. 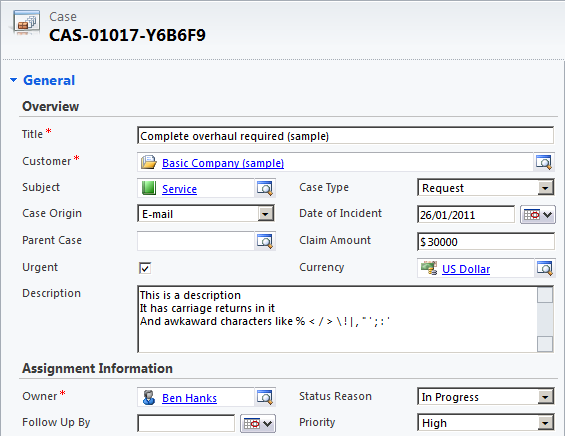 The “Create Invoice” button creates an Invoice record. It does not change the status of the Order. Invoicing is treated as parallel process to Order Fulfilment, you can generate the Invoice before or after Fulfilment. The “Cancel Order” button changes the Order status to Cancelled but does nothing else. If an Invoice has been generated it remains active and the parent Quote record remains Won. Pretty much everything said for Orders applies for Invoices, the same set of buttons are available to update the Product details or Pricing or to cancel the Invoice. The last step of the sale process in CRM is to click the Invoice Paid button, which closes the Invoice and updates the Status. The CRM functionality gets weaker as you progress through the sales process into Order and Invoice. 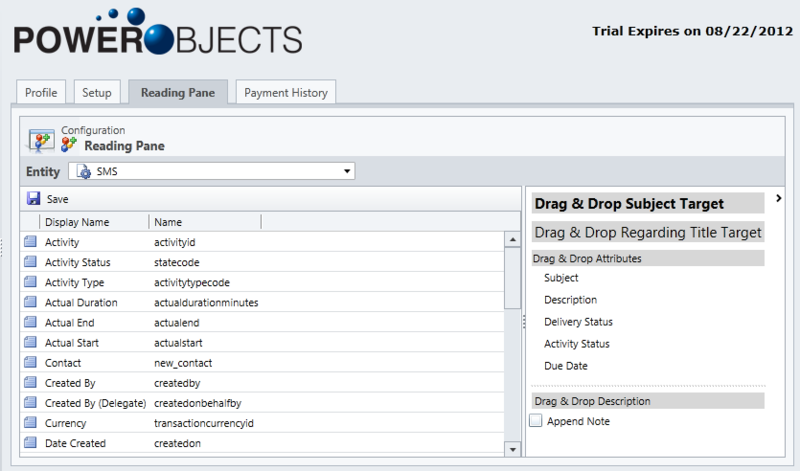 You really are crossing across into ERP territory by this point and I think these CRM entities really exist as placeholders to represent ERP Order and Invoice data that is expected to be fed to CRM by integrations you implement. 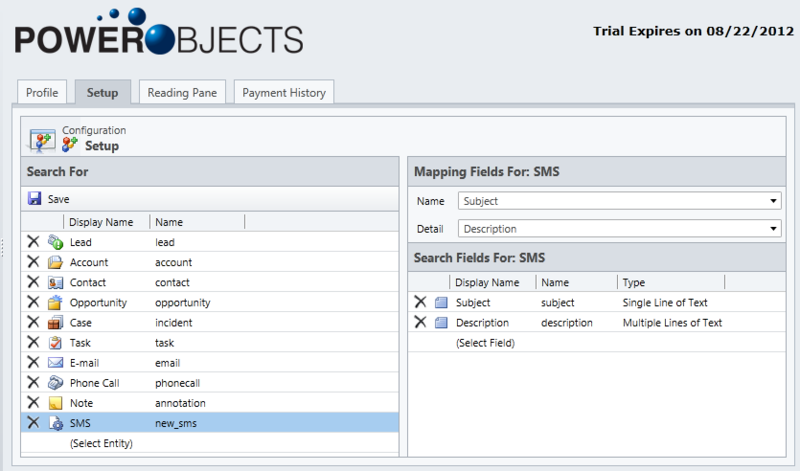 There are sample SSRS reports for Order and Invoice available on each form which you can customise to your requirements. Noticeably absent from this whole process is tax calculations. 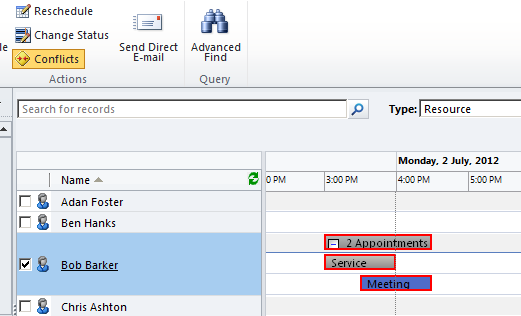 This is further evidence that Microsoft have not tried to create ERP competing sales order processing functionality. Sales Territories seem to have no effect in CRM, they exist to supply a data structure that you may chose to utilise in your reports and workflows. Or you can happily ignore Sales Territories (I’ve never used them on a CRM project). 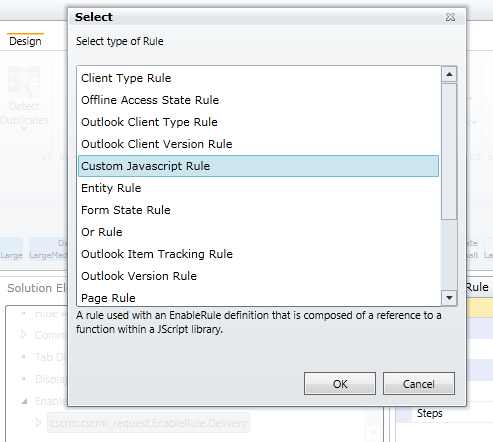 Sales Quotas are a deprecated feature from CRM 4.0 that is still around in CRM 2011 but not expected to be around in the next version. 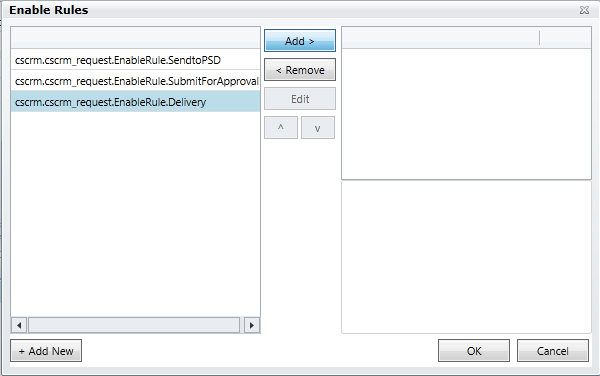 The Goals feature introduced in CRM 2011 is meant to be used instead. 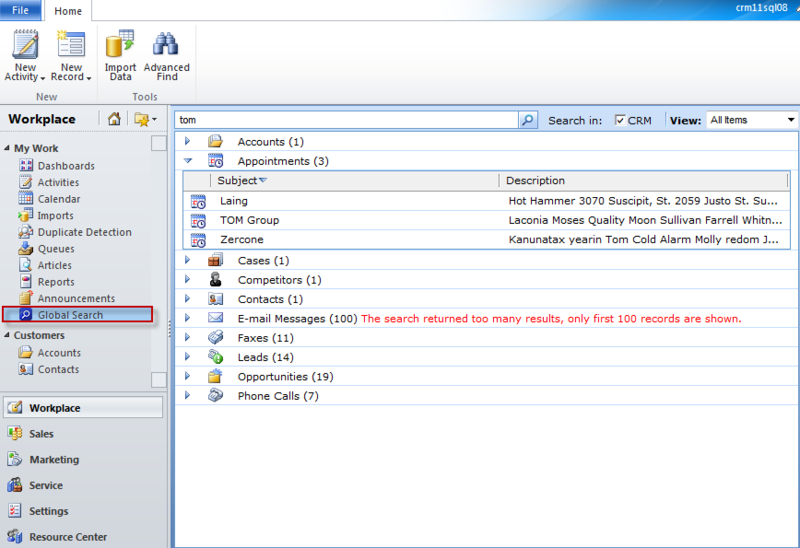 Whilst you will see Sales Quotas appear on the menu in CRM 2011 the feature is not usable. I guess Microsoft have retained a read only view of this data to allow those that were using it to move over to Goals once they upgraded. The Sales Literature feature in Microsoft CRM allows you to use CRM as Document/File repository. The Sales Literature record itself is a header record – maybe you would create one per Product. Beneath that header record you create Sales Attachment records. Each one of these has a file attachment and metadata that describes that document. Search keywords can be specified here but CRM never offers a useful way of searching against these. Instead of creating Sales Attachment records under a Sales Literature record you could implement Microsoft CRM’s native integration to SharePoint and enable a SharePoint document library under each Sales Literature header and have the documents stored in SharePoint rather than CRM. 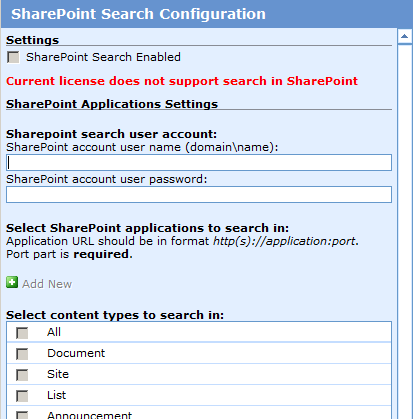 If you wanted to use SharePoint though maybe don’t even bother with the Sales Literature record, just enable a SharePoint site for each Product record. Sales Literature records can be associated to Products such that when looking up or drilling down on a Product in CRM you can easily access the Product’s Sales Literature. It’s a bit ‘clicky’ though. One nice thing you can do from the Sales Literature form is you can click a button and an CRM email form will be launched with all of the Sales Attachments added as Attachments. Sales Literature can also be associated with Competitor records and then easily accessed from the Competitor form. Competitor records in CRM are used to represent those organisations you compete with. You can store some competitive intel on these records for your sales force to refer to. You can associate Products from your Product Catalog to Competitors (not sure why you would want to, I guess the idea is to indicate which of your products each of your Competitors also sells). Open Opportunities can be associated to one or more Competitors. This has no real effect except for providing a description of the competitive landscape, something someone could refer to or some boffin could write reports about. As you close an Opportunity as Lost you can select the Competitor you lost to. This is quite valuable and a feature I always encourage customers to use. 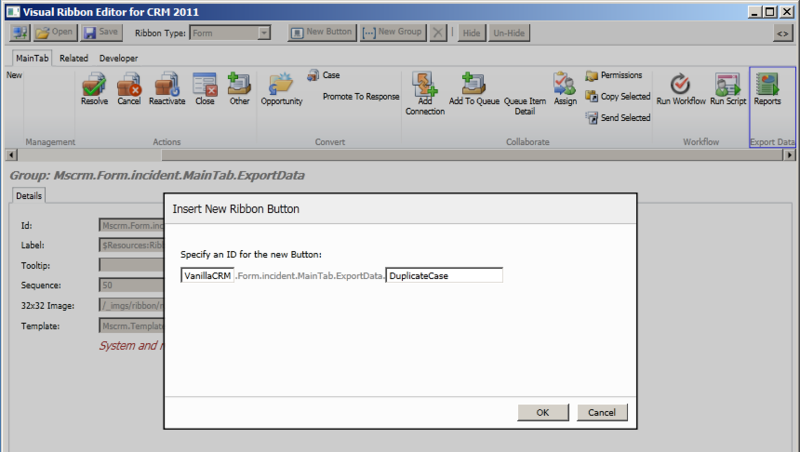 This entry was posted in Uncategorized and tagged CRM 2011 on July 12, 2012 by Gareth Tucker.